Bring these plans together to meet FSMA requirements. Since the publication of the FSMA Preventive Controls Rule for Human Food, the term HARPC has become a common way of describing the type of food safety plan that is needed to comply with the requirements. On first glance its similarities to HACCP could possibly lead one to believe that the requirements for both systems are aligned. But beware, there are a number of fundamental differences and one main contradiction in the requirements, which requires a clarity of understanding when trying to amalgamate the two systems. With the introduction of the FSMA Preventive Controls Rule, food facilities that have HACCP systems are now faced with the difficult task of trying to adapt their current food safety system to meet the HARPC requirements. These facilities will continue to be required by local law in the countries where they export to, by their customers and by standards such as those recognized by the GFSI to adhere to the HACCP principles. A straight swap from HACCP to HARPC is not going to be an option for many businesses. Therefore, a combined approach is required, one that meets both sets of requirements and has a clear, practical and effective methodology. One of the consequences of combining the requirements of HACCP and HARPC is that all of the control principles need to come together and work as one. For this reason, the distinctions between pre-requisite controls (PRCs), preventive controls (PCs) and critical control points (CCPs) must be fully understood. 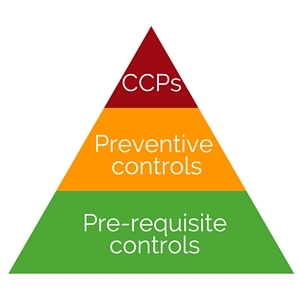 There is a hierarchy to the controls, with PRCs being the building blocks for facility-wide general controls; PCs are more specific controls that are typically associated with a particular step in the process; a CCP is one that is above and beyond a PC and is critical to the safety of the food (see Figure 1). A PC is one that either prevents the hazard from occurring in the first place, or if the hazard has occurred, it recognizes it and minimizes the impact of the hazard by controlling it and not allowing it to be released as product. A CCP controls a hazard that is inherently expected in the product by eliminating it or reducing it to a level at which it is safe. There are a number of differences between the requirements of HACCP and HARPC. The PC Rule is not as specific or detailed in the way in which the plan should be documented or designed, as the principles laid out in the National Advisory Committee on Microbiological Criteria for Foods (NACMCF) or Codex Alimentarius. However, the FDA may not have directly stated that certain elements such as product description, intended use or intended user must be included, but they do elude to the fact, as the hazards that must be assessed would require this information to be understood and fed into the system. This means that in order to comply with both systems, the principles of HACCP must be adhered to as well as those of HARPC, so elements such as process flow diagram will still be required. The key difference between the systems related to how significance is determined within the risk assessment. Both systems require a risk assessment that takes into account the severity of the hazard and the likelihood of the hazard occurring. The results of this should determine if the hazard is a significant food safety risk, where it is, and whether a PC is required. Hazards that are not significant would need to be managed through the application of PRCs. 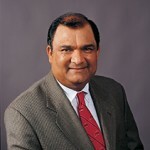 The PC Rule asks for the likelihood to be determined in the absence of any controls. HACCP principle states that the likelihood should be determined, taking the controls into account. It is acceptable to HACCP principles to follow the requirement for HARPC and carry out the assessment in the absence of any controls, however there are consequences in doing so. The number of significant hazards that will be produced will be substantially higher than in a traditional HACCP plan. Each of these hazards will need to be controlled through a PC, and the CCPs will need to be determined from this set of PCs. Using the typical CCP decision tree is not a practical solution, as the result will likely mean that most of the PCs become CCPs. Nobody wants to go back to the days when facilities had many, many CCPs, as this produces an unmanageable and ineffective food safety system. A new methodology is required for the determination of CCPs—one that is clear and does not contradict the HACCP principles. Although the introduction of HARPC makes designing and developing a food safety plan more complicated, it does have its benefits. Over time, as pre-requisite programs have developed, the number of hazards that are managed by PRCs have grown—to the point now where most facilities only have a handful, if not one or two, CCPs. Through a HACCP plan, even very significant food safety hazards can be managed by the PRCs. These significant hazards are therefore managed, just the same as insignificant or low-risk hazards. This may be the reason that the most common recalls and withdrawals today are due to lack of control from pre-requisites. By introducing the new tier of PCs and assessing significance without taking any controls into account, we mitigate this problem. Ensuring that the key food safety hazards, which perhaps are not critical, are managed through the application of PCs and they thus receive additional focus. “Comparing the Standards for HARPC”. Techni-k. Retrieved from http://www.techni-k.co.uk/comparing_the_standards_for_HARPC. Marsh, K. (2016). Combine Your HACCP & HARPC Plan. In this article, we present thoughts from an industry insider: Bob Savage, President and Founder of the HACCP Consulting Group, shares lessons learned from a career’s worth of HACCP implementations. Having access to technology can help companies more effectively assess risks, analyze data and be audit ready. Focusing on the importance of prevention, facility maintenance and sanitation. Kassy Marsh is the author of Combine Your HACCP & HARPC Plan, step-by-step. Marsh started her career in the food manufacturing industry in 1998 and developed simple and practical solutions that can be effectively implemented into the factory environment. She is well known for her best practice risk assessments and specializes in food safety principles. In 2015 she co-authored the book ‘Assessing Threat Vulnerability for Food Defence’. This pioneering methodology is now one of the leading risk assessment tools in use for the assessment of food threats. To meet the increasing demand for a methodology to assess food integrity, in early 2016 Marsh developed and co-authored her second publication ‘Assessing Error Vulnerability for Food Integrity’. This system is now used by a leading UK retailer as a training tool for their supply base. 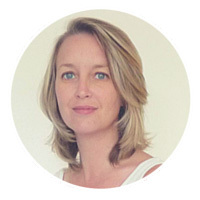 Since starting her own consultancy business in 2012, she has become well regarded in the field of food safety risk assessment for her ability to provide simple, practical and easily understood step-by-step solutions. Marsh can be contacted on kassy.marsh@techni-k.co.uk or www.techni-k.co.uk.